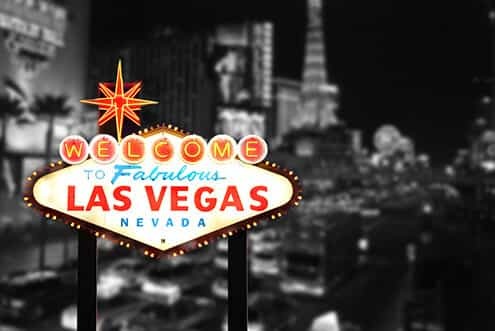 Las Vegas, Nevada, is recognized around the world for its party atmosphere, and this often correlates to higher rates of substance abuse and addiction. Mexican black tar is the most popular form of heroin in Las Vegas.24 It is smuggled in regularly from outside US borders. 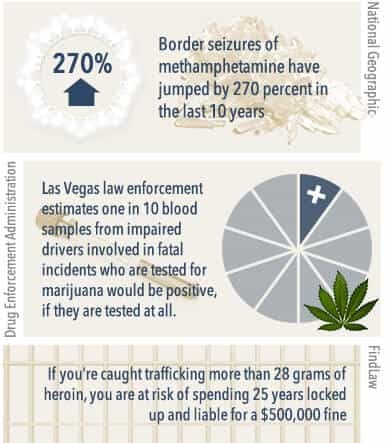 Border seizures of methamphetamine have jumped by 270 percent in the last 10 years.25 Many people are behind bars serving time in Las Vegas for drug-related criminal activity. Often, drug overdoses are intentional, but many are accidents, too. 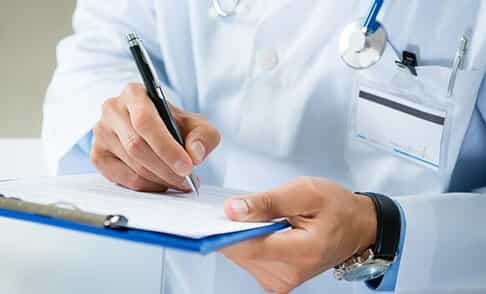 Thus, many people end up in emergency rooms seeking treatment following inappropriate use of prescription and illicit drugs and alcohol. Clients have the option of paying for treatment on their own — something many people choose even when they do have insurance in an effort to keep their experience private — or using health insurance benefits. Most plans today cover at least some portion of substance abuse treatment and even more pay for treatment for mental illness. State and federal aid are given via grants to many Nevada facilities every year, and much of it is passed on to clients. Some are even given free treatment based on financial need. Nevada Council on Problem Gambling, Inc.
“Las Vegas city, Nevada.” (2014). United States Census Bureau. Accessed Sep 11, 2015. “State & County QuickFacts.” (2014). United States Census Bureau. Accessed Sep 11, 2015. Szalavitz, M. (2011 Nov 7). “Study: Whites More Likely to Abuse Drugs than Blacks.” TIME Magazine.Accessed Sep 11, 2015. “Poverty Status in the Past 12 Months.” (2013). United States Census Bureau. Accessed Sep 11, 2015. “Substance Abuse and Mental Health.” (n.d.). Helpguide. Accessed Sep 11, 2015. “Mental Health, Poverty and Development.” (n.d.). World Health Organization. Accessed Sep 11, 2015. “Facts: Las Vegas.” (2012 Sep 28). National Geographic. Accessed Sep 11, 2015. Nauert, R. (n.d.). “Problem Gambling Linked to Substance Abuse.” Psych Central. Accessed Sep 11, 2015. Frazier, K. (n.d.). “Gambling Addiction Statistics.” LovetoKnow. Accessed Sep 11, 2015. “Substance Use and Mental Disorders in the Las Vegas-Paradise MSA.” (n.d.). Substance Abuse and Mental Health Services Administration. Accessed Sep 11, 2015. “What is the scope of marijuana use in the United States?.” (June 2015). National Institute on Drug Abuse.Accessed Sep 11, 2015. “Drunkest Cities.” (n.d.). Daily Beast. Accessed Sep 11, 2015. “Americans are Drinking More — A Lot More.” (2015 Apr 23). NBC News. Accessed Sep 11, 2015. “Alcohol-related deaths: How does your state rank?.” (2014 Jun 27). CBS News. Accessed Sep 11, 2015. Myers, L. (2012 Dec 31). “24-hour Mental Health Facility Sought for Las Vegas.” Las Vegas Review-Journal.Accessed Sep 11, 2015. “Mental Illness Facts and Numbers.” (n.d.). National Alliance on Mental Illness. Accessed Sep 11, 2015. “Nevada Laws & Penalties.” (n.d.). NORML. Accessed Sep 11, 2015. “The Dangers and Consequences of Marijuana Abuse.” (2014 May 5). Drug Enforcement Administration.Accessed Sep 11, 2015. “Nevada Heroin Laws.” (n.d.). FindLaw. Accessed Sep 11, 2015. Marin, M. (2015 Jul 8). “Heroin deaths on the rise.” Las Vegas Now. Accessed Sep 11, 2015. “Substance Abuse Prevention and Treatment Agency 2012 Community Profile.” (May 2012). Nevada Division of Mental Health and Developmental Services. Accessed Sep 11, 2015. Valdez, M. (2014 Oct 9). “The 10 Most Suicidal Cities in America.” Insider Monkey. Accessed Sep 11, 2015. “Grading the States 2006: Nevada – Narrative.” (2006). National Alliance on Mental Illness. Accessed Sep 11, 2015. “Substance Abuse Treatment Facility Locator.” (n.d.). Substance Abuse and Mental Health Services Administration. Accessed Sep 11, 2015. “Sober Living Directory.” (n.d.). Intervention America. Accessed Sep 11, 2015. UNLV Media Relations. (2011 Feb 25). “UNLV Report Confirms Viability of Nevada’s Problem Gambling Treatment Programs.” University of Nevada, Las Vegas. Accessed Sep 11, 2015. “Licensed Clinical Alcohol & Drug Abuse Counselor.” (2013 June 30). Nevada State Board of Examiners.Accessed Sep 11, 2015.